Crimson Flower -- 紅花: What I Recently Read: "Hanabusa-san: The Guard of the White Horse Loop Line"
What I Recently Read: "Hanabusa-san: The Guard of the White Horse Loop Line"
Synopsis: This volume compiles three chapters with interconnecting stories revolving around Hanabusa, the conductor of the White Horse Loop Line. Chapter 1: Four passengers get on the train over several days. One passenger's luggage handle is broken, another passenger is down on his luck and looking for a job, another passenger is newly arrived from the sticks and takes the long way to her station everyday, and another passenger is a dog who was abandoned by a boy. Chapter 2: It's the city centennial. Is Hanabusa going? Meanwhile two former passengers want to visit Hanabusa, though one passenger is looking for Hanabusa senior, who died five years ago. There is an interwoven theme about clocks and watches in this chapter. Chapter 3: It's a flashback to Hanabusa's childhool and adolescense. Hanabusa was abandoned on a train which begins Hanabusa's life as a conductor apprentice under the senior Hanabusa. Then adolescent Hanabusa meets a drifter who gives Hanabusa a glipmse of the larger world outside the city and the White Horse Loop. Note: We never learn whether Hanabusa is male of female. Artwork -- A: It's about as lovely and detailed as shoujo gets. The two pages spreads are full of flower sprays and lovingly drawn architecture. The character designs are very appealing. Everyone is distinct and clothing details add a nice touch to each character. Presentation -- A: This is an HC Special, so the book is larger than the usual Betsuhana compilations. There is also a color page. I like the cover art a lot. In fact, the cover is what inspired me to make this blind purchase. Story -- Chp 1 A- , Chp 2 D, Chp 3 B: The compilation is broken into three chapters about the daily routine of train conductor Hanabusa. Flashbacks are used frequently to fill in Hanabusa's background. The many stories of the individual passengers are told concurrently and weaved together to create a final connected story. The first chapter starts a little slow, but once it gets going, it's by far the best chapter. The second chapter went nowhere until the very end, and at that, it was still unspectacular. The third chapter covers Hanabusa' s childhood and adolescence. Parts of this tale are poignant, but I had a hard time accepting the conclusion the mangaka makes about Hanabusa. Overall, I'd say the stories are uneven, and went a storyline dragged, it was a real slog for me to get through. 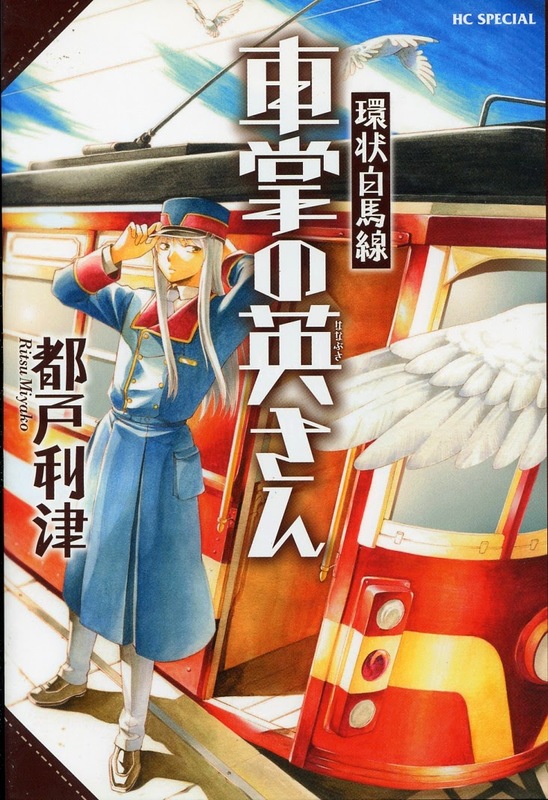 This is a bit of weirdness with manga that keeps the reader at a distance from Hanabusa and the passengers. Hanabusa and Hanabusa senior are the only characters given names. I understand that this is part of the storytelling, but it still felt weird to be intentionally kept at a distance from the main character and the passengers. An unintended consequence for me was that I become invested in the dog character more than any human, because I could accept at the dog as "The Dog". Also the story of the dog is the only time we actually see Hanabusa behave like a normal human. There are also a bunch of homespun homilies about customer service that get tiresome after a while. Readability -- Medium: This book has furigana. The homilies have some weird phrasing, but overall it's not a difficult read. Overall -- B-: The forced distance put between the reader, Hanabusa, and the passengers really irked me. But I think this is a strong personal preference. The book is worth getting for the strong first chapter, the poignant third chapter, and the lovely artwork throughout. The second chapter is a dud and can be skipped without missing anything. If you like relaxing slice-of-life stories and don't mind being put into strict observation mode as a reader, then you'll like this book. If you want to dig into characters and "feel" as you read along, you should probably skip this. I doubt this book will be licensed or scanlated, so it's really only accessible to those who can read Japanese.